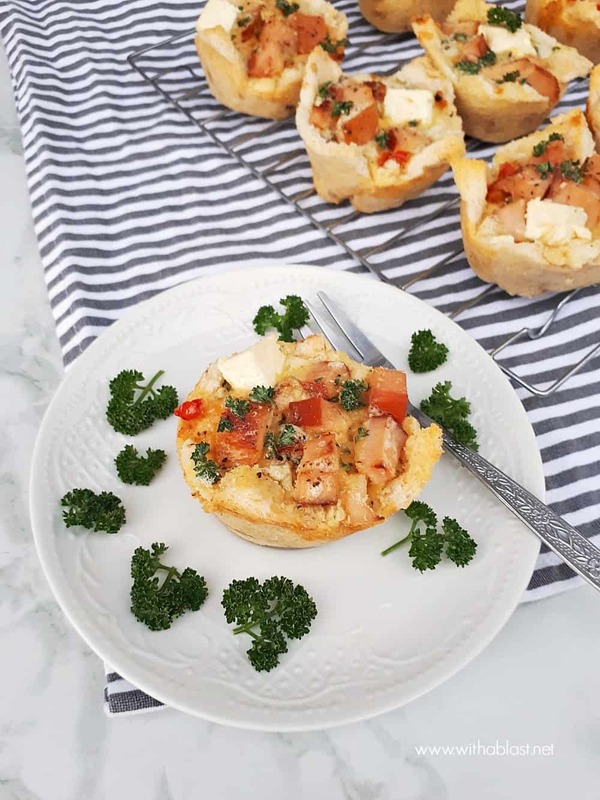 A very versatile recipe for Chicken and Creamy Garlic Bread Baskets – serve as a light dinner, snack or as an appetizer. 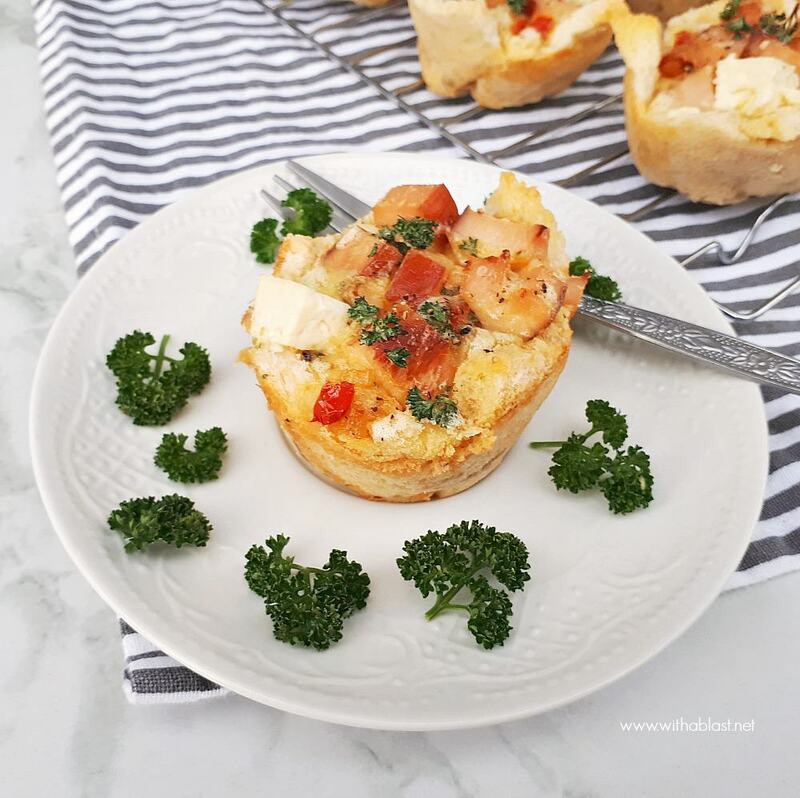 Perfect to use up leftover Chicken and Bread. 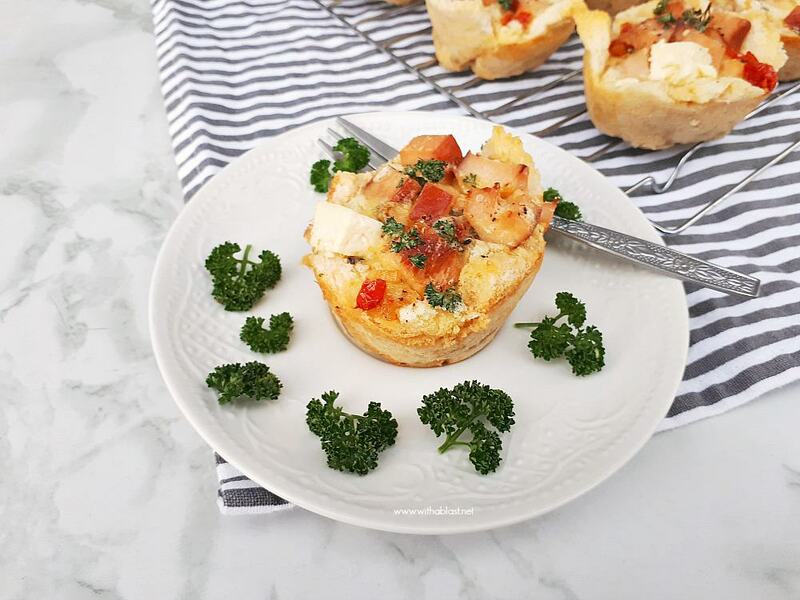 Two or three of these Chicken and creamy Garlic bread baskets, add some salad and you have a quick dinner. These are also great as a party snack as well. Sturdy and will not break apart when taking a bite. Therefore another ideal addition to your savory party platters ! I found this recipe, originally, on KNORR’s website, but as usual with me, I changed it a little. 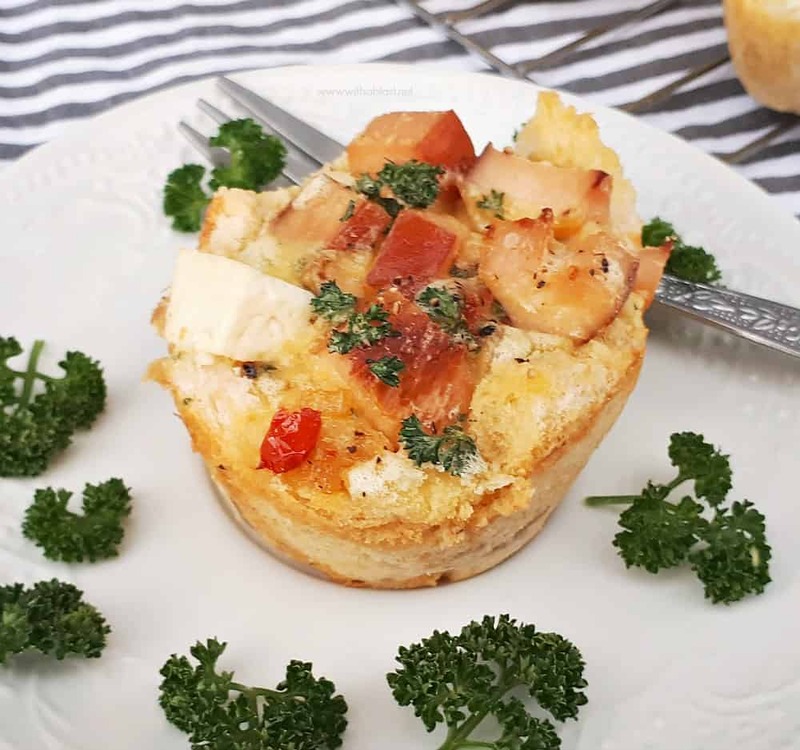 The muffin sized snack might look small, but be assured, it is loaded with sauteed onion and tomato, Chicken as well as Feta cheese. 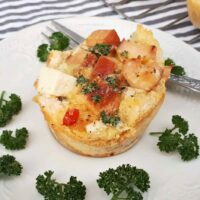 And then there is also the eggs which binds all the ingredients together, leaving you with the perfect appetizer, snack or light dinner. 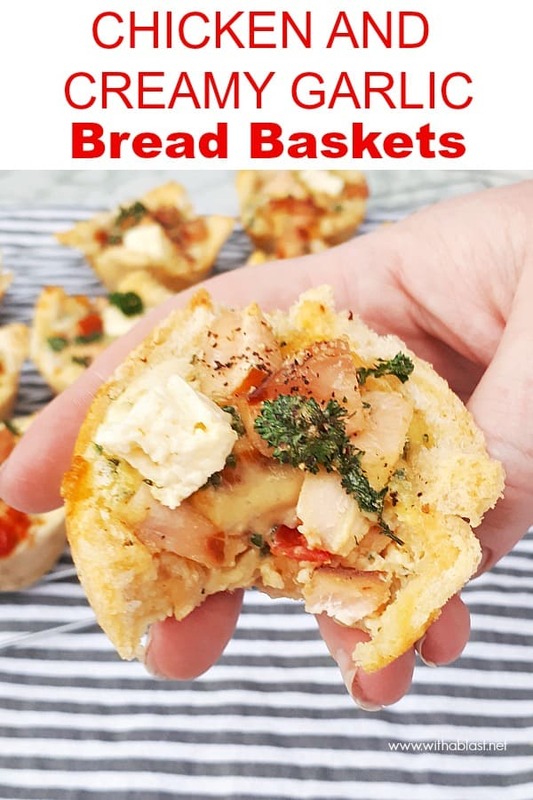 We mostly have these Chicken and creamy Garlic bread baskets as a light dinner. However, I do make them quite often to add to my savory party platters. Should you for some reason do not have a packet of the KNORR sauce powder on hand, simply make your own. Combine one heaped tablespoonful of Cornflour (Cornstarch) with a tablespoonful of fresh Garlic. Mix well and use as per the instructions below. TIP: when you pour in the Egg mixture – start with a little to each basket, giving it time to run into all the openings between the filling. By the time you have done all 12, add the remaining mixture starting from the first basket you filled. Serve hot or cold ! Hi Linda! 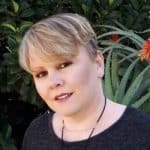 I am just dropping by to let you know that I have nominated you for the Liebster Blog Award. You can check it out by going to http://florassippigirl.blogspot.com/2013/02/liebster-award.html – I hope you drop by. Have a great day! Just found you though a Country Cook link and scooted over here to peek through some of your posts. Oh MY!!! Does this sound good!!!! Very clever, and quite delicious. I hope to make these soon. Thank you for sharing so that we might all enjoy. Looks wonderful. I like the ingredients, pretty on hand things. Thank you for sharing. Visiting from Fllour Me with Love. How fun! These look really good. I'll have to try them! 🙂 Have a great week. Visiting from Chaya's Recipe Box link up. These baskets look like fun! That looks & sounds so delish. Great choice. These look really yummy! Thanks for sharing at my weekend link party @The Weekend re-Treat! What a great idea and a great recipe for a upcoming ladies luncheon that I am hosting. Hope you are having a great Valentine weekend and thank you so much for sharing with Full Plate Thursday. Sounds wonderful – like the slice o bread crust! Thanks so much for sharing on Busy Monday!